Frank Stitt, owner of Highlands Bar & Grill in Birmingham, Alabama, started his culinary education by working for the late great cookbook author Richard Olney in Provence, France. 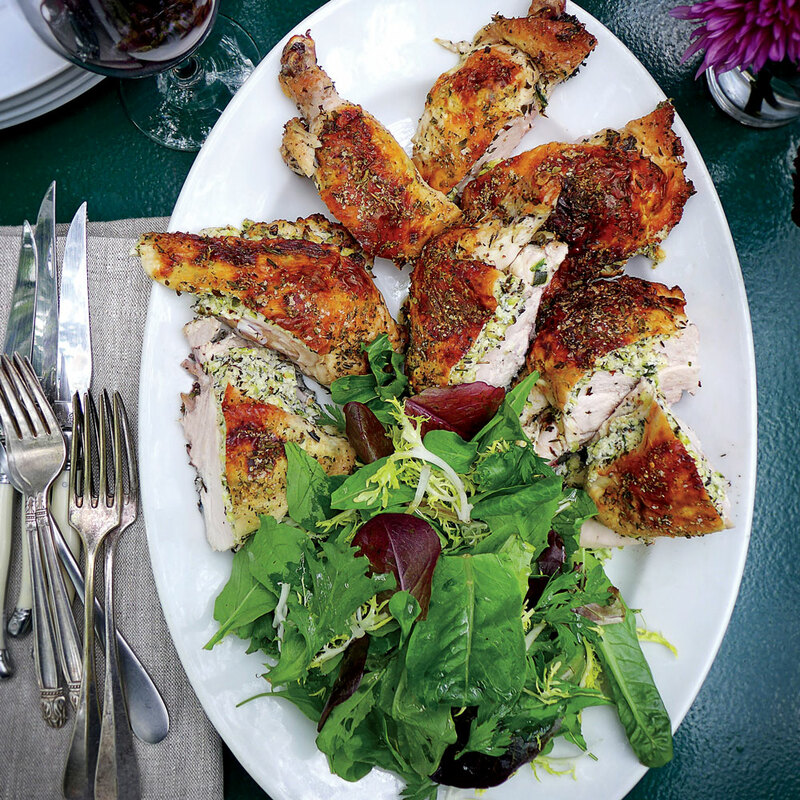 This chicken recipe, which was a favorite in Olney’s cooking classes, was originally published in his book Simple French Food. Spatchcocking, or removing the backbone and cooking it flat, makes the chicken cook more evenly and quickly. Stitt recommends serving it with a powerful, elegant Bourdeaux to show of its beauty and balance. For an easy dinner party experience, prep the chicken the night before and leave it uncovered on a rack in the refrigerator over night. Toss together zucchini and 2 teaspoons salt in a colander set over a large bowl. Let stand until liquid is released, about 20 minutes. Transfer zucchini to a clean kitchen towel. Squeeze as much liquid from zucchini as possible. While zucchini stands, pat chicken dry. Place chicken, breast side down, on a cutting board. Using poultry shears, cut along both sides of backbone; remove and discard backbone. Turn chicken breast side up. Place a heavy skillet on chicken breast, and press firmly against breastbone until it cracks and breast meat is an even 1-inch thickness. Transfer chicken to a wire rack in a large baking pan. Cut off wing tips at second joint; discard wing tips. Using your fingertips, gently loosen and lift skin from flesh of breasts, thighs, and drumsticks, being careful not to tear or totally detach skin. Set spatchcocked and prepped chicken aside. Preheat oven to 425°F. Stir together ricotta, breadcrumbs, Parmigiano-Reggiano, softened butter, marjoram, egg yolk, drained zucchini, 1 1/2 teaspoons salt, and 1 1/2 teaspoons pepper until combined. Stuff zucchini mixture under skin of chicken breast, thighs, and drumsticks; carefully replace skin. Mold and evenly distribute stuffing, shaping and patting skin on outside of chicken. Stir together herbes de Provence, remaining 2 teaspoons salt, and remaining 1 1/2 teaspoons pepper in a small bowl. Drizzle oil over chicken, and sprinkle with herb mixture. Bake chicken in preheated oven until skin is lightly browned, about 20 minutes. Reduce oven temperature to 325°F. Bake, basting after 30 minutes, until a meat thermometer inserted into thickest portion of thigh registers 155°F, about 50 minutes. Remove chicken from oven, and let rest until thermometer registers 165°F, about 20 more minutes. Carve chicken into 8 pieces and serve. If you’re serving it with this menu, one chicken will feed 4 to 6. Double the recipe to feed a crowd.